Well, it's that time again. 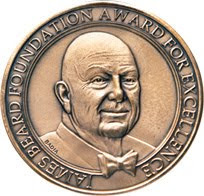 And the James Beard Foundation, the nation's most prestigious recognition program honoring professionals in the food and beverage industries, has once again announced its list of restaurant and chef semifinalists for the 2010 James Beard Foundation Awards. The foundation's Restaurant and Chef Committee selected the nominees from 21,000 online entries. According to the press release, an independent volunteer panel of more than 400 judges from across the country will vote on specific award categories to determine the final five nominees in each category. Those nominees will be announced on March 22, following which the same panel of judges will pick the winners, announced at the foundation's annual gala on Monday, May 3, 2010 at Lincoln Center’s Avery Fisher Hall. And I'd just like to say that this year my personal good luck wishes go out to the Locanda Verde Restaurant down in Tribeca here in NYC, and Chef Andrew Carmellini, in the "Best New Restaurant" category. There's some great atmosphere and food happening down there (especially those beyond awesome brunch pastries) and clearly...you guys totally rock!